Our heroes head to Delphi. Everyone's favorite Warrior Princess returns this month in the pages of Xena #8. 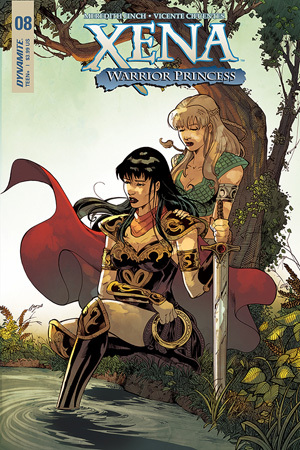 In this latest exciting issue from Dynamite Entertainment and the creative team of Erica Schultz and Vicente Cifuentes, we find Xena and Gabrielle mounting up and heading for Delphi to rescue Nazar's parents from the clutches of the villainous Oracle. Meanwhile, the Amazonian village comes under attack from a faceless assassin looking to kill the Yung girl at all costs. This sends Queen Keenta and her brave warriors into action, but as many of her sisters fall valiantly in battle, she soon realizes this foe is unlike any she has ever faced. Rejoining with Xena and Gabrielle as they reach the city, the heroic heroines invade the haunt of the mystical Oracle - who's as intent as ever to destroy all connections to Nazar and keep their life exactly the way they like it. However, our heroes have a different plan in mind, eventually toppling the Oracle and their faceless assassins once and for all. 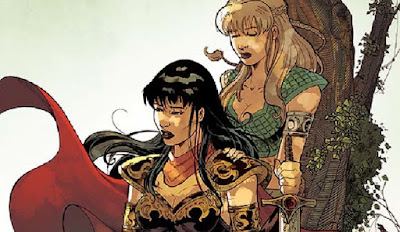 Yet, even as they leave with Nazar's parents, eager as ever to reunite with their daughter, a mysterious figure slinks out from the shadows to assure the Oracle that all will soon be well - with Xena and Gabrielle gone for good. The latest issue of Xena continues to spin a poetic love letter to the classic 90's series. Neither he action, fun or humor let up for so much as a second - and it makes you feel oh so good! If you're a fan of this much-loved character, than you need to be reading Erica Schultz's Xena. The story is engaging, while the art courtesy of the always talented Vicente Cifuentes is as on point as ever, adding a whole new dimension of fun to this truly enjoyable tome. Rating: 5/5 - "A series so full of fun! This one never disappoints." Xena #8 hits newsstands Wednesday, September 26th.